Tips on Getting Clothes Tailor Made in Hoi An, Vietnam. With its French colonial architecture, small, narrow streets, and some of the best Vietnamese cuisine, Hoi An is a place full of small town charm. It’s hard not to fall in love with its laid back simplicity the moment you arrive. It’s a popular traveler’s stop between Hanoi and Ho Chi Minh City (formerly Saigon) for people looking to break up the long trek. Hoi An is also a wonderful place to get away from the busier and crowded bigger cities. However, Hoi An is also known as a shopper’s haven, with most tourists coming for one thing in particular; getting clothes tailor made. Getting clothes tailor made is probably the economical driving force in Hoi An. Streets are filled with tailor shops all jostling for your business. Fabrics cram the shelves, model items are on display, and owners are ready to help the moment you show interest. Walking the streets and admiring all the shops can be exciting. It’s like going shopping but better, because you get to choose exactly what you want instead of trying to fit into a pre-produced design and size. Your mind races with ideas, beautiful fabrics draw your attention, and the prices that are quoted make you think you’re going to have to buy another suitcase to fit everything you’re about to buy! As exciting as it sounds, in reality, getting tailor made clothes can be rather overwhelming and if you don’t come prepared you might just throw in the towel all together. Our first morning proved just that, walking from store to store, trying to pick out fabrics, choose colours, and decide on a design was way too much right away. I hadn’t anticipated all the decisions I’d have to make. It wasn’t until a lunch break complete with a beer and some time to compile our thoughts that we were able to get our footing. This is the most important part of the game. If you arrive prepared, then everything else will fall into place and decision-making becomes that much easier. The best way to be prepared is to know in advance what you want to have made. This was my first mistake. I knew I wanted a dress made, but that was about it. When I started looking at various shops I suddenly realized I had come unprepared and it was frustrating for myself and the shop owners since I couldn’t make a decision. To help the process, have a few items in mind and/or even print some pictures if you can (most shop owners have computers, so having your pictures on a USB stick works as well). Tristan knew he wanted a suit or two made and it made things easier when shopping for him. It’s also good to have an idea of the colours or types of patterns you’re interested in as well. Once you know what you’re looking to have made, the next step is to find a shop that will make it for you. We did a little research online to see which shops got favourable reviews and which ones didn’t. We wrote down the recommended ones and spent the afternoon wandering the streets, getting a feel for each shop we stopped in. It’s important that you feel comfortable and confident with the people or person you’ll be dealing with. Think of it almost as a though you’re conducting a job interview. You’re trying to find the best person for the job of making your clothes. In the end, you’re hiring them and you want the best for the job. Some qualities to look out for: they should be helpful but not pushy, willing to take the time to help you decide on fabrics and design, have at least 1 or 2 fittings with you, be able to listen to your suggestions and/or concerns, and lastly, be friendly. In the end, you want to have a good experience with the person you’ll be dealing with and it really boils down to your intuition. You’ll be able to sense that “it” factor or vibe that will tell you this is the right person. It also doesn’t hurt to ask them where they get their work done, as most sewing is not done onsite. 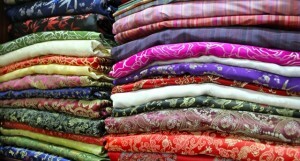 Silk fabrics to choose from. You don’t need to be a fabrics or sewing expert, but you should be aware of some things to look out for when choosing materials. Generally speaking, the higher the price, the better the quality. If you’re getting a suit made, opt for at least the mid-range price of fabric. This is an item you’ll have in your closet for years and will get a lot of wear, so you don’t want to go cheap here. When choosing fabrics make sure to feel them, drape a part over your shoulder and see how it looks and hangs. If you’re getting things lined (the fabric on the inside part of the garment that usually is not seen) make sure it’s decided before hand the quality (silk is preferred) and the amount of lining required. For a dress, the lining should come all the way down to the hemline (edge of the dress). Stitching and sewing techniques is a bit more advanced and to be perfectly honest, I don’t know which kind of stitching is used when. But personally, I’ll look at the stitching and check that it’s tight, straight, and doesn’t bubble the fabric. Once you’ve chosen your design and fabrics, you’ll place your order and the shop owner will measure you. You’ll have to pay some sort of deposit, usually about 25-50% of the garment cost, but be sure to only pay a portion of the cost and not the full amount. Ask for a swatch (a piece) of the fabric you’ve ordered so that you can ensure the same material was used on your garment. We’ve read a few stories online of stores charging for the higher quality fabric only to swap out for a lesser quality fabric during the sewing process. Ask the shop owner when you can come for your first fitting, which may be later that day or the next morning. After Tristan and I got our heads wrapped around this tailoring business and made some decisions about what we were looking for, we opted on two different shops to get clothes made. The first shop we ordered clothes from was called Tony the Tailor. They had received some very good recommendations online and we really liked the women running the shop. Tristan ordered two suits, a dress shirt, and two silk ties. I ordered two dresses from pictures I had found online. We were excited and proud that we had made our first orders! The next afternoon we arrived back at Tony the Tailor for our first fitting. Tristan went first with his suits. He pointed out a few areas that needed some changes, one sleeve felt tighter than the other, it was a bit tight across the shoulder blades, and one of his pants needed to be loosened around the waist (too much good food apparently). The ladies marked down the changes that needed to be made and then it was my turn. One of the dresses I had ordered had some fabric detailing at the top. The picture I had given showed the fabric folded over, like a fan, to create a pleated effect. It was important that the pleating was done carefully and the stitching done in the right places so that it was invisible to the eye. Unfortunately when I put it on, it looked like I had a limp lettuce leaf hanging off the top of my dress. The women immediately said it was just the first fitting and that they only needed to see it on me to make the final adjustments for the second fitting. I also asked them to continue the lining all the way down to the hem on the dress (you could see right through it) and to continue the belt around the back of the dress. The second dress was much closer to the picture I had shown but I was very disappointed in how the back of the dress was finished. It looked cheap and flat and made me think they wanted to save money by using less fabric. I let it go, but asked that the fabric going over the v-neckline be tacked together so I wouldn’t have any wardrobe malfunctions when I wore it. The next morning we arrived back for our second fittings. Tristan’s suits looked great and the changes he had asked for were made. He was a satisfied customer. Unfortunately for me things didn’t improve much from the day before. I put on the second dress from the previous day only to be very disappointed at what reflected back at me in the mirror. The area that I asked to be tacked was done so poorly and so obviously that it ended up pulling some of the fabric, resulting is a very unflattering bust line. I was torn about what to do. One of the shop ladies clearly saw it on my face and said I didn’t have to take it if I didn’t like it. I knew I wouldn’t end up wearing this dress and decided I wouldn’t take it. The other dress had been improved since the first fitting, but again the pleating still didn’t look right. I was told ironing would fix the problem (“wait, I have to fix this with ironing?”) but I had them make a few more changes. Over all, I wasn’t very satisfied and only took the one dress, but luckily I’ve got two amazing women back home who can give the dress the TLC that it definitely needs. In the end I would recommend Tony the Tailor for getting suits made but would shop elsewhere for dresses. Side Note: It’s important that you fully check the garment and really think about how it feels on you. Don’t wait for the shop owners to find any mistakes. And be picky. You’re the one who has to wear it after all. The other shop we ordered clothes from was called Dong Duong Indochine. I ordered a fall/winter jacket from one of their display models and had them copy a pair of my travel pants that had seen better days. I ordered the garments in the morning and had my first fitting in the afternoon. I was very impressed with the tailoring and how quickly they made them. I would definitely recommend ordering clothes from them. Remember to plan ahead, take a day to look around and find the shop that feels right to you, and to give yourself about 3 days for the entire process.